The BOOT 100 Million m3 /year Ashkelon Desalination Plant is comprised of two identical plant facilities – North and South – which started operation in the middle and at the end of 2005 respectively. The plants are based on the concept of a Three-Center Design: a pumping center, a membrane center and an energy recovery center. 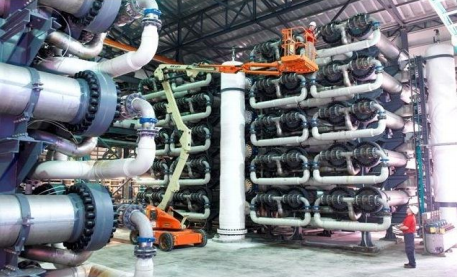 A pumping center comprised of 3+1 large High-Pressure (HP) pumps, 5.5 MW each, supplies seawater to all 16 RO banks, 105 pressure vessels in each, via a common feed ring. An energy recovery center, made up of 40 DWEER, collects pressurized brine from all 16 RO banks, transfers the energy to the seawater and pumps it to the same common feed ring. The scheme of the Three-Center Design is presented in the attached diagram. The Three-Center Design is flexible and efficient in operation. The 16 RO banks can operate with one, two, three or four high pressure pumps and demonstrate a wide range of productivity. In each operation mode pumps demonstrate high efficiency, close to 90%. The start of the first HP pump against the RO banks is smooth; and the pressure can be increased as slowly as required. The procedure on pump hook UN and UP is fast and simple. All RO banks demonstrate equal productivity, recovery, and feed flow distribution.